While I watched very little of the debate, missing out on its aftermath was not as easy. No one at meetings mentioned it, but just chatter and discussion at lunch. Clearly, everyone has a higher tolerance for watching that thing than I did. Good for you. But I don't think it changed anyone's mind one way or the other. I do love the coke-sniffing rumours that are going around about DJT. It could explain a lot. I was talking to a friend of mine - a lawyer, as if it matters - who lives in a split house. His husband is a small business owner - a florist, as if it matters - and is voting for (t)Rump. I won't say in the past I understood the vague term, irreconcilable differences'. However, this scenario could be grounds for divorce. I know all couples have fundamental issues and disagreements, even GOP versus DNC. That's on thing, but supporting (t)Rump? This isn't like voting for Goldwater. What really tees me off about the debate......I mean, besides the debate itself....is that I missed the Indians clinch the American League Central Division. The first time since 2007. If there are other debates, it is debatable (ha! get it??) that (t)Rump will actually participate in another one. At least that is what several news sources have implied, as has Rudy G, Donny's close personal friend and adviser. Should Il Douche opt out of further debates, he'd have my undying respect. But it would still be a welcome gesture. And if there are debates, I'll just watch the Tribe in post-season instead. 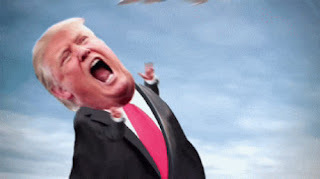 there are supposed to be 2 more debates; the rump is already bitching about the next one cause "anderson cooper is mean to me, I want him replaced". This whole thing is making my head spin and stomach churn. And it ain't Her that's causing these symptoms.